After playing for a while now it's time to update the pack. I got rid of the ThorUI persona (character) window as it lacked some features in the window, especially in the mercenary area, so i reverted that to the DarqUI one, and i've updated the new features which got released under the new DarqUI. I also added the DrumsUI Black/Gold skinpack to make all windows look neatly black and gold! If u use any other resolution, u might have to adjust the layout yourself, else it should be plug and play! After an absence of nearly 8 years, i decided to return to Everquest 2. My god this game has changed, but i like it! This time i went with DarqUI as the base of my UI as it is a solid well written UI conversion, however i didn't like some components about it so i started the search to add my own sprinkles to it. I ended up with the "Himay" style Player/Group and Target's, as i loved em that much when i played back in the days, so i'm glad they still exist! I also used a fair few parts from DrumsUI, as they were more fitting for me, and some other bits and bobs i'll list down here! Screens of Group Fights and Raid will be added soon (Hopefully)!!! Bottom right chatwindow is used for /ooc, channels and other spammage. Top left chatwindow is for the combatspammage, top right is for spellspammage, they show on action or mouseover. The 6x2 Hotbars above rightchat window show on mouseover. The top buff effects are the Effects on U and the one on the right is for ur Maintained spells. Rest is pretty clear from the pictures I think. Darqwood, for most of the UI conversions,great work there! Drumstix42, for alot of nice UI improvements! RickF7666, for his nice Player window and Castbar! Tooplex, for his nice Group window! Aseekia,for his Pet window and Sigrdrifa to keep it alive! Respect to Rick, Tooplex and Aseeka for keeping the Himay style alive! Myanta, for his awesome Target and Implied target sets! Blackhood, for the ThorUI Persona window! diabolist, for the funky Breath bar Bubbles! Seagoat, for his awesome Target Ring! Everyone from the EQ2Map Team! Everyone supporting my mod compilation! The Guild and Guildies from Eden now on the Thurgadin server and Everyone else I might have forgot!! Thanks for ur support and hope u enjoy my UI compilation!!! How to fix LFG window. The LFG window is not working. In your custom UI folder find the file named eq2ui_mainhud.xml and open it in windows notepad. 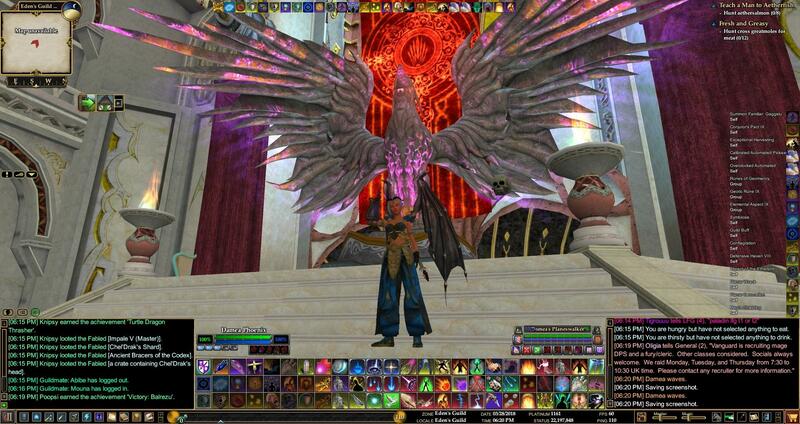 Save the file and load up EQ2 and see if you get the new LFG window. Last edited by snus : 06-26-2007 at 01:42 PM. Is there any way to make the targeting window smaller? It stretches over nearly half my screen and takes up quite a bit of room. I really like your UI but appear to be using a smaller screen resolution than you designed for. Indeed this UI is designed for 1280x1024 resolution. The only thing u can do really is delete those targets from the Custom Map. Then u will have default target and implied target windows. U can also check the site here for targets u like, download em and just copy them into the Custom Map, select yes when it asks to overwrite. Last edited by DraconisNoir : 10-20-2006 at 01:02 AM. Has anyone else tried the new version? I unpacked it and got a custom.rar file instead of the .zip or a folder. Last edited by Valkiera : 10-09-2006 at 07:08 PM. 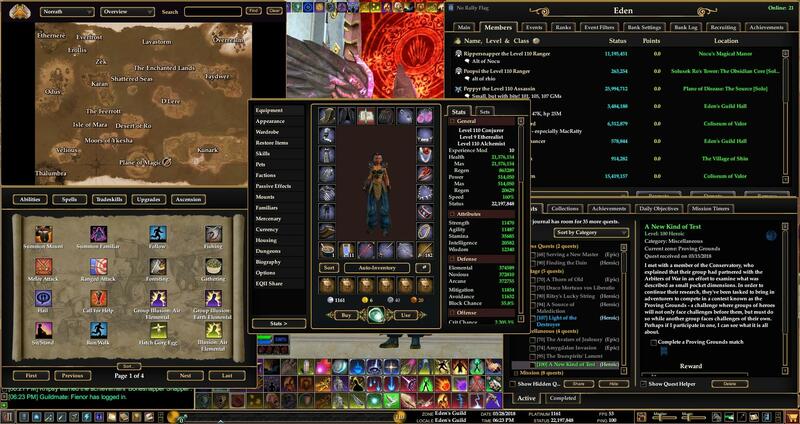 Anyone have a similar UI since this one is no longer being updated? Are you working on the update Damea? The new changes forced me to return to the default and I miss your UI. All you have to do to use this UI with the new broker system is copy the trader file from your default UI folder and move it over to your Damea folder. Fairly simple fix for it. wondering if you plan on updating this due to LU24? Had to switch UI's since it won't work with the new broker system. U will have to reset the modded targets then. Just delete those 2 files and ur set, u can look for seperate targets in the download section that u like to replace em also. Hope this helped u further! This is the best interface I've found but none of the effects on my target shows up. This is a big deal for a pvp server is there any way to get this in the mod? I was curious about a quick fix for a vertical group layout as in the picture versus the horizontal one. or even a quick and dirty walkthrough on how to change it. I have noticed every time I start the game certain settings, such as master volume, keep reverting back to settings other than what I set them to. Any ideas on how to get my changes to stay after I log out? Got a fix for you Abellda works well. UpperLimit="20" Value="number here will vary"
change the value="put in your number here from 0 to 20" to a higher number to increase volume or a lower number to decrease (dont change the upperlimit just referencing that for where to look for the value number to change), whatever the number you put in divide it by 20 and that will give you the number it will show on slider in game, like if you want sound at max 1.000 change it to value="20" or if you want something in between can just throw in whatever number your looking for, like if you want 0.250 as the number on the slider shown in the mod, it would be value="5"
so if you want to set the shader to say 150 instead of 300, you would lower the value (instead of increasing) to value="10"
Hey Damea love the UI think its great. Had a question though. I used to have the ^^^ arrows over the target window and the mobs but now its gone. I reinstalled the game yesterday just to clean up old files then installed your newest UI but dont have the ^^^ anymore...wondering if you took them out or if I did something. Set that to Detailed and u shud have ur arrows back!! Very nice UI. Keep up the fine work.